On any given chilly morning or sunny afternoon you will find Khelo children running around to score a try, can be in Brooklyn or Boistala or any of our 25 Khelo Rugby locations in Kolkata. India today is still one of the major countries where half of the urban population are living in slum areas. Most of the Khelo communities we work with are in these slum areas. There are many many health related issues for the children growing up in these slums, specially in the monsoon season. Diseases such as dengue, malaria, typhoid take many lives in the rainy season. “Health and Hygiene” was selected for the month of September as the theme for our Khelo Rugby Program. The main objective was to work with the Khelo children to help them better understand issues around personal hygiene – such as washing hands with soap and eating healthily and raise awareness about monsoon diseases such as dengue and malaria both for the children and their communities. 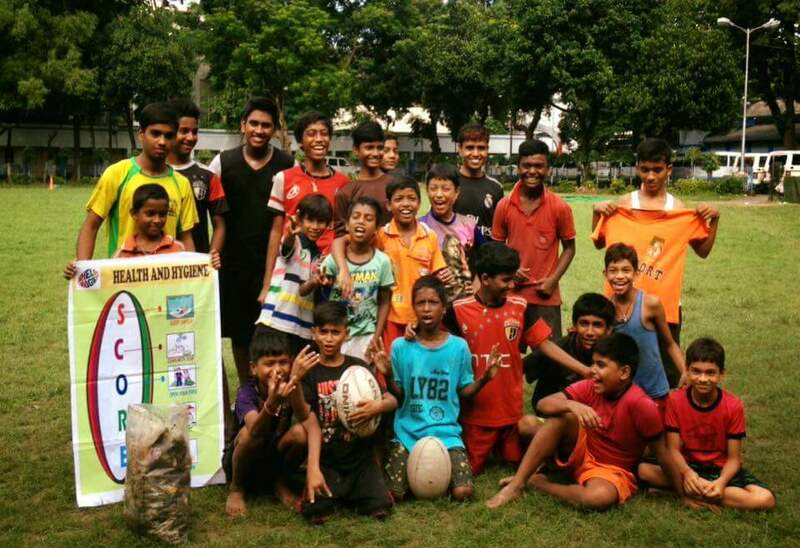 At Khelo Rugby we try to work on different social issues affecting communities by using fun games, rallies, street plays and charcha sessions. We encourage the children in Khelo to came up with their own innovative ideas to deliver these messages. We want the children to be leaders in their own communities and pioneer what we do together. The Health and Hygiene month was a tremendous example of this, with children devising their own posters, organising rallies and getting out and about in their own and neighbouring communities to share the messages they had devised. This is neatly summed up in this 90 second film featuring some of their activities. SCORE: Since we work with young children, the medium we choose to deliver key messages is very important. Shashi one of our young leaders from Howrah Philkhana designed an info-graphic poster “SCORE”. 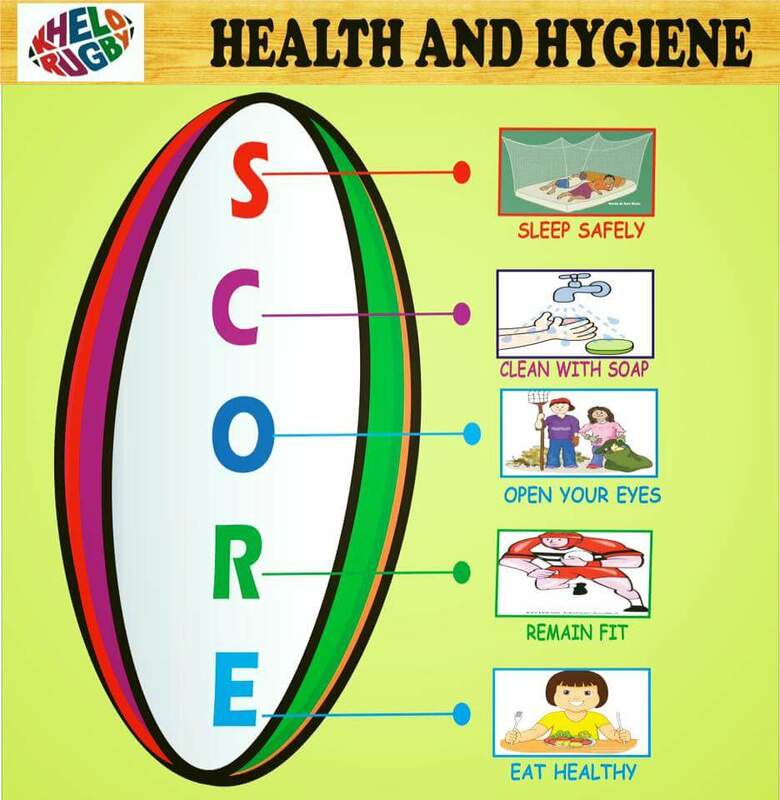 In the graphic the word “SCORE” is used to convey important messages on the wider topic of health and hygiene. The meaning of SCORE is short, catchy, sweet and meaningful. Sleep Safely – Use a mosquito net. Sleep for 8 hours. Early to bed, early to rise. Clean with Soap – Wash hands with soap. Take bath daily. Keep nails trimmed to keep germs at bay. Erase germs with soap. Open your Eyes to Your Surrondings – Keep your home and surrounding area clean. Use dustbins and empty dustbins regularly. Remain Fit – Play Sports. Walk, jog, run. Exercise regularly. Encourage your family to stay fit. Eat Healthy – Eat plenty of fruits and vegetables. Eat boiled and well cooked food. Drink plenty of water. Avoid salty snacks and soft drinks. This excellent infographic from Shashi gave our coaches and young leaders great support in delivering these important messages. September at Khelo Rugby was all about health and hygiene. It is important our young leaders and children are fully engaged and leading the way on our monthly themes – they have to be owned by them. Through awareness campaigns, cleanliness drives, charcha session and the SCORE infographic we were able to support children in taking a small step forward in living safer lives.